Part of the Battle of Kursk, the assault on Prokhorovka was the last push of the German army to take the eastern front. 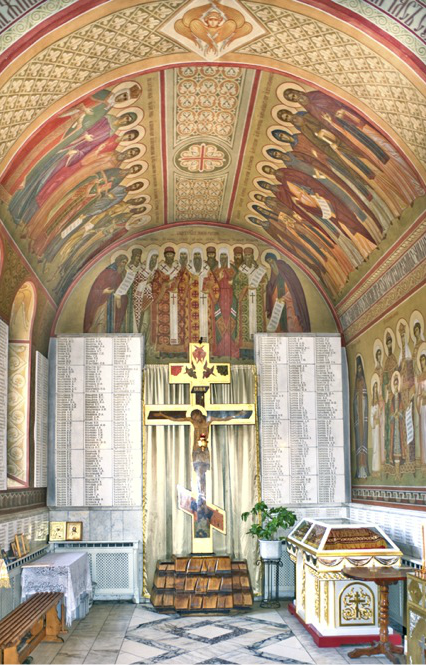 The original headline for this article was: The Prokhorovka Memorial Complex: Bearing witness to sacrifice and faith. All photos are by the author. In the middle of the rich agricultural lands of Belgorod Region lies the ​small town of Prokhorovka (population 9,000). At the beginning of World War II, it was little more than a railroad whistle stop near a collective farm, but events in summer 1943 conspired to make it one of the most important places on the planet. It was at Prokhorovka that the German army’s final offensive effort on the eastern front was stopped for good. The origins of Prokhorovka date to the late 17th century, when a settlement known as Ilinskaya Sloboda was established by Polish settler Kirill Ilinsky, who moved to the Belgorod lands following the Russo-Polish war of 1654-1667. In addition to its rich soil, the area was located near the origins of the Psyol River, making it an ideal site for farming. After 1860, the village bore the name of Alexandrovskoye in honor of the reigning Tsar, Alexander II. The name Prokhorovka appeared in the 1880s on a nearby station on the newly opened Kursk-Kharkov-Azov Railroad, one of whose engineers was V. I. Prokhorov. Alexandrovskoye absorbed the station into its territory after World War II, and the town was renamed Prokhorovka in 1968 in a recognition of the fame of the Prokhorovka battlefield. The epic clash that occurred at Prokhorovka on July 12, 1943 was part of the much larger Battle of Kursk, which lasted from July 5 to August 23 and is recognized as the biggest tank battle of all time. The Battle of Kursk began when the German army launched Operation Citadel, an attempt to use a pincer formation to smash a large bulge at the center of the eastern front created by the sporadic fighting following the Soviet victory at Stalingrad. The north side of the bulge formed as a result of Soviet gains during the Kharkov Offensive in February and early March 1943. This part of the offensive also led to the German evacuation of the Rzhev salient, a bloody stalemate that had cost hundreds of thousands of casualties in 1942. In the south, however, a German counteroffensive retook Kharkov and Belgorod in the middle of March, thus denting the Soviet line and creating the south flank of the bulge. At that point, both sides consolidated positions in anticipation of more favorable conditions in the summer. Lacking the sweep of summer operations the preceding two years, Operation Citadel was Hitler’s last attempt to achieve a major tactical victory on Soviet territory. On the north flank, Soviet forces led by Konstantin Rokossovsky held the Wehrmacht to modest gains despite a massive assault. On the south flank, German forces led by Erich von Manstein had greater success against the Voronezh Front commanded by Nikolai Vatutin and posed a threat to Kursk and its vital rail junction. In order to blunt the German armored thrust developing toward Prokhorovka, on July 10, Ivan Konev, commander of the newly created Steppe Front, rushed forward the Fifth Tank Army, led by Pavel Rotmistrov. The approach of Rotmistrov’s tanks on the morning of July 12 brought a massive concentration of military hardware in a relatively confined space. The rapid movements of armored vehicles combined with the dust and smoke over broad fields created the proverbial fog of war, and to this day historians argue about the details of the battle, including the actual strength of the opposing forces and their losses. It is now accepted that the Soviet losses in armor were much larger than the German. Soviet aviation was more active on the northern flank, and Rotmistrov’s exposed, lighter tanks were outgunned by SS armored formations. Nonetheless, the desperate Soviet effort succeeded in its main task of halting von Manstein. Shortly thereafter, Hitler halted Operation Citadel and began withdrawing forces to deal with the threat to Italy posed by the Allied invasion of Sicily. The Red Army in turn launched offensives that culminated in the march to Berlin in spring 1945. In the interests of boosting war morale, the clash at Prokhorovka was proclaimed not just a critical part of an overall strategic victory (which it was) but also a tactical victory over SS divisions (now considered a debatable assertion). 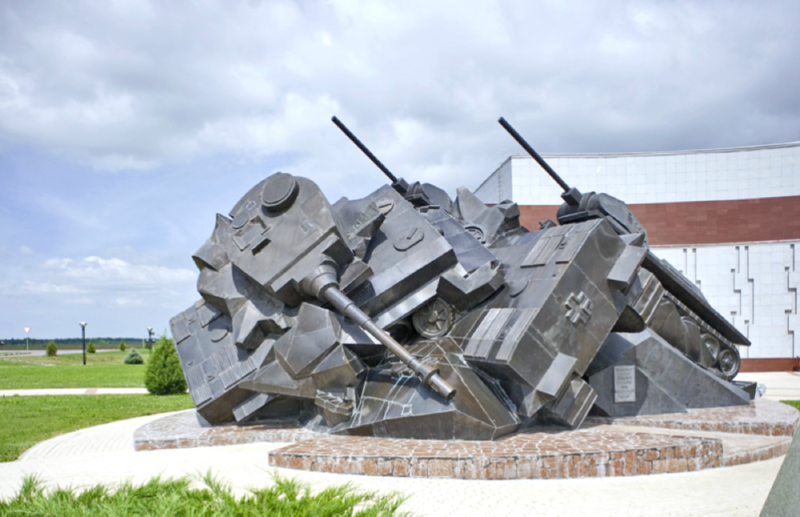 After the war, the Prokhorovka battlefield was enshrined as a memorial to Soviet resistance against the Nazi invaders. Pavel Rotmistrov returned to the site for a commemoration 25 years after the battle, yet many felt that not enough had been done to mark this extraordinary event. Regional public efforts advocating a higher level of commemoration found a major ally in 1993 when the prominent politician Nikolai Ryzhkov actively supported the construction of a major memorial complex at Prokhorovka. The site was now designated Russia’s Third Battlefield (Tretye ratnoye polye), following Kulikov polye (Snipe Field), where Dmitry Donskoy defeated the Tatars in 1380, and the Borodino battlefield, where the Russians fought the French on their approach to Moscow in early September 1812. This memorialization campaign resulted not only in a new museum but also in the creation of a narrative that placed the struggle in religious, and specifically Russian Orthodox, terms. As Ryzhkov proclaimed in a widely distributed article in November 1993, “We will build a temple at Prokhorovka.” The realization of this campaign, which found enormous public and state support, is readily evident in the ascending tower of the Cathedral of Sts. Peter and Paul, visible on the approaches to Prokhorovka. 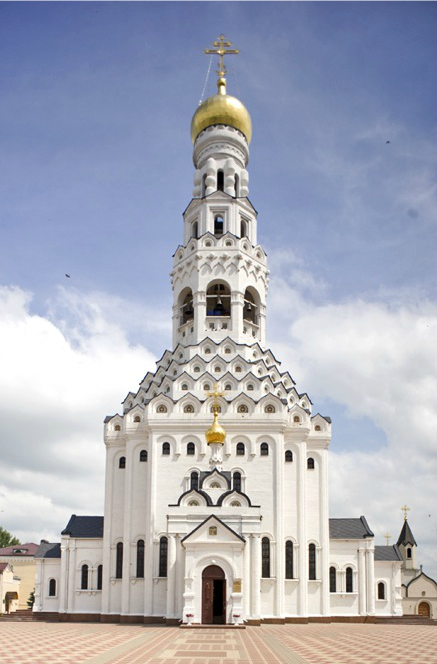 Completed in the spring of 1995, the shrine was consecrated on May 3, 1995 by Russian Orthodox Patriarch Alexy II. The interior of the Cathedral of Sts. 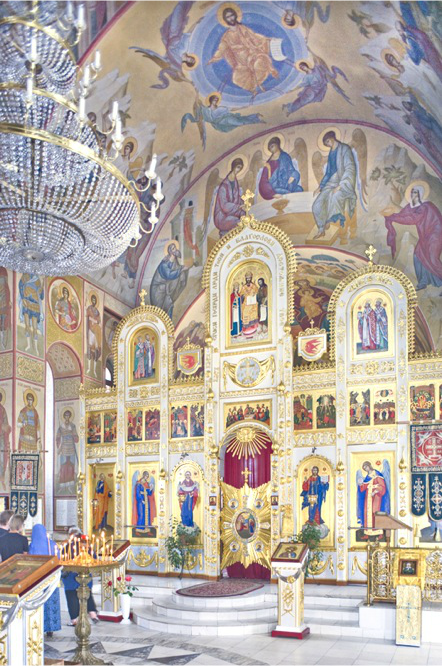 Peter and Paul is richly decorated with frescoes, mosaics and icons. It also includes the names inscribed on marble tablets of some 7,000 Soviet soldiers who died in the days surrounding the Prokhorovka battle. The territory around the cathedral includes the more modest parish Church of St. Nicholas, a parish house and a center for war veterans. To the southwest of the cathedral is an arched monument containing the “Bell of Unity of Three Fraternal Slavic Peoples” — Russian, Ukrainian and Belarussian — who made the essential contribution to the victory. This monument, surmounted with an Orthodox cross, was dedicated on May 3, 2000, in the presence of the three presidents of the respective countries — Vladimir Putin, Leonid Kuchma and Alexander Lukashenko — as well as Patriarch Alexy II. Beyond the cathedral memorial complex is a large museum built during the same period. 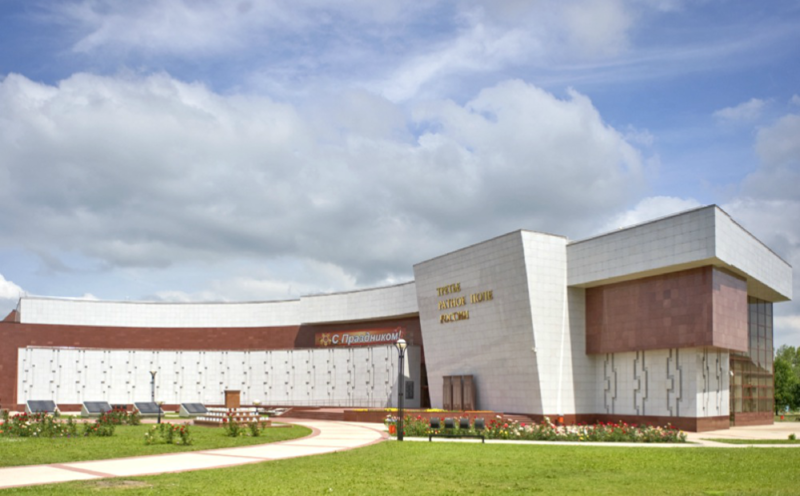 Its several interior halls present the military history of Prokhorovka and the Kursk Battle, as well as the larger context of the Great Patriotic War, as World War II is known in Russia. 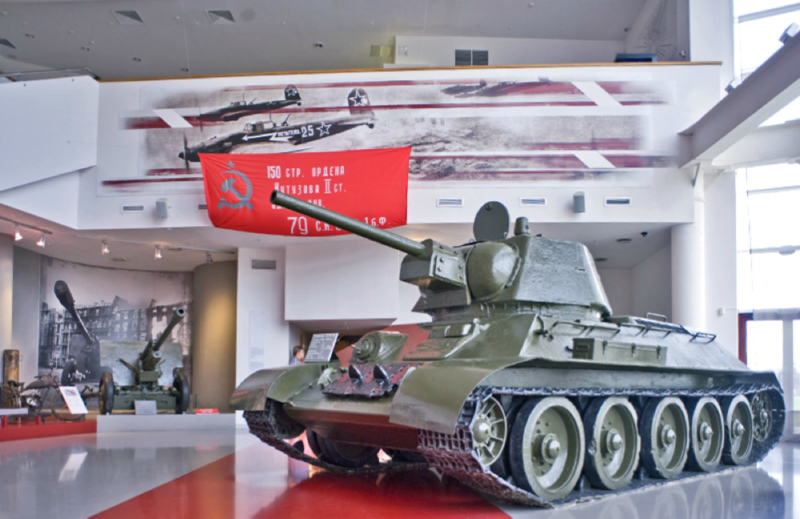 In the center of the main atrium is an example of the legendary T-34 tank, the workhorse of Soviet armored forces. The memorial complex, located in the center of Prokhorovka, is complemented by a monumental bell tower 59 meters in height. 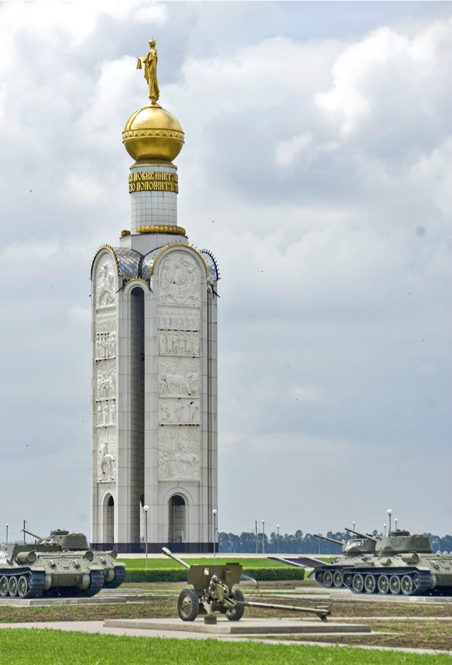 Designed by Vyacheslav Klykov and dedicated on May 3, 1995, the tower consists of four sides with relief panels devoted to the sacrifices and the religious faith that led to victory.